Ocean turbulence dissipation rate is estimated either by means of microstructure shear measurements, or by adiabatically reordering vertical profiles of density. The latter technique leads to the estimate of the Thorpe scale, which in turn can be used to obtain average turbulence dissipation rate by comparing the Thorpe scale to the Ozmidov scale. In both cases, the turbulence dissipation rate can be estimated using single vertical profiles from shipborne instrumentation. We present here an alternative method to estimate the length scale of overturns by using the Ellison length scale. The Ellison scale is estimated from temperature variance just beyond the internal wave band, measured by moored instruments. We apply the method to high resolution temperature data from two moorings deployed at different locations around the Josephine seamount (North Eastern Atlantic Ocean), in a region of bottom‐intensified turbulence. The variance of the temperature time series just above the internal wave frequency band is well correlated with the Thorpe scale. 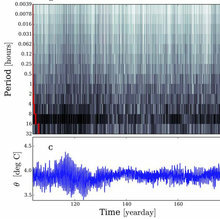 The method is based on the time‐frequency decomposition of variance called “maximum overlap discrete wavelet transform.” The results show that the Ellison length scale can be a viable alternative to the Thorpe scale for indirectly estimating turbulence dissipation rate from moored instruments in the ocean if time resolution is sufficiently high. We suggest that fine structure contaminated temperature measurements can provide reliable information on turbulence intensity.